Today when in some quartiers the printed word has become almost passé it is difficult to comprehend how revolutionary and transforming the development of printing was in the 15th and 16th centuries. My mind turned to consider such matters as I came away from a thoroughly enjoyable exhibition at the Royal Academy, called Renaissance Impressions which runs until 8th June and features chiaroscuro woodprints from two collections, those of Georg Basselitz and the Albertina in Vienna (http://www.royalacademy.org.uk/exhibitions-and-events). With the advent of printing came the need to find ways of adding illustrations to the books and the art of printing from woodcuts was developed. This enables readers to appreciate great art which otherwise they would only be able to see in situ. Although the prints started out as copies they develloped into an art form in their own right. 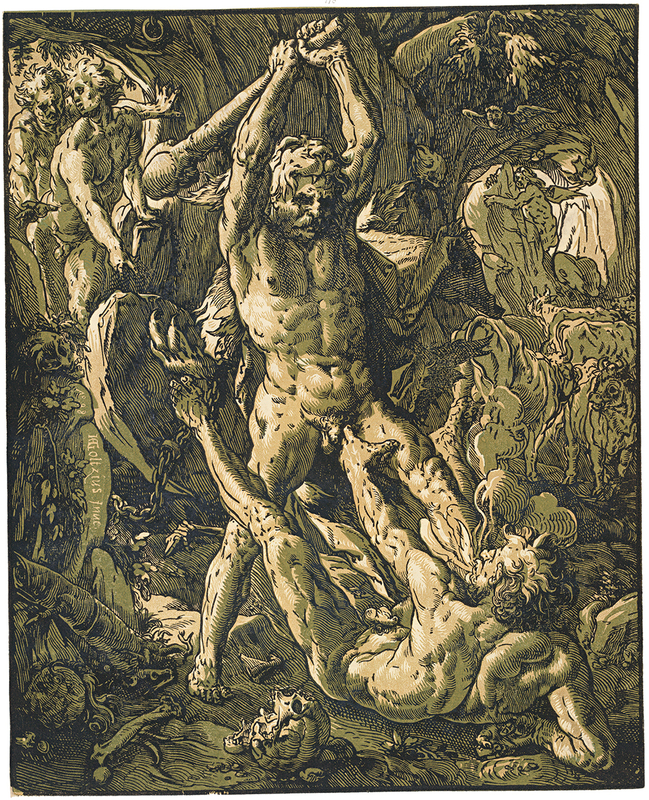 Chiaroscuro woodcuts use two or more blocks printed in different colours. The technique was probably invented by Lucas Cranach the Elder in Germany in around 1508 or 1509 and another school developed in Italy under Ugo da Carpi in Italy around 1516. In Germany the technique hit its peak of popularity in the 1520s with the keyblock or line block printed in black and the tone block or blocks had flat areas of colour. The Italian technique which lasted longer into the 16th century were produced without keyblocks and the effect and subtlety achieved are markedly different. The key thing about woodcuts is that they were capable of mass production (or at least as mass as they got in those days) and it was interesting to see versions of the same woodcut using different colouration with markedly different results. The pioneering example was Burgkmair’s Emperor Maximilian on Horseback of 1508 which established the woodcut as a medium for propaganda. There he is, astride his horse and dressed in fluted armour, the gold shading adding to the image of grandeur. Spread over 4 rooms and boasting some 150 or so exhibits there was so much to feast your eyes on. 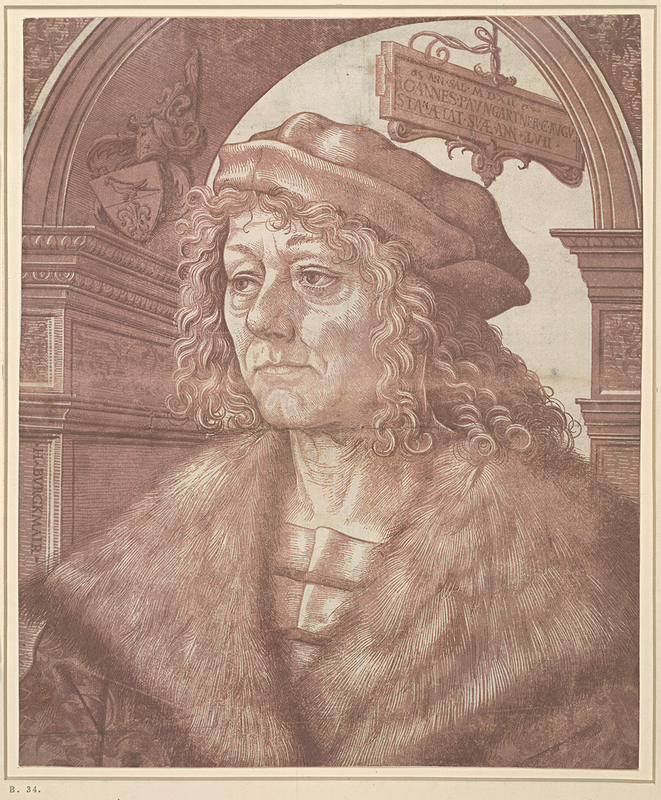 There was Durer’s famous Rhinoceros woodcut, which set the template for how many generations conceived of the creature. For sheer breath-taking impact, particularly as I viewed it on Maundy Thursday, was Hans Sebald Beham’s “Head of Christ Crowned with Thorns”, the careful use of white in the cut so suggestive of tears and sweat. One wall was devoted to Andrea Andreani’s nine part frieze entitled The Triumphs of Caesar from 1599 which itself was, probably, the final triumph of the chiaroscuro woodprinter’s art. 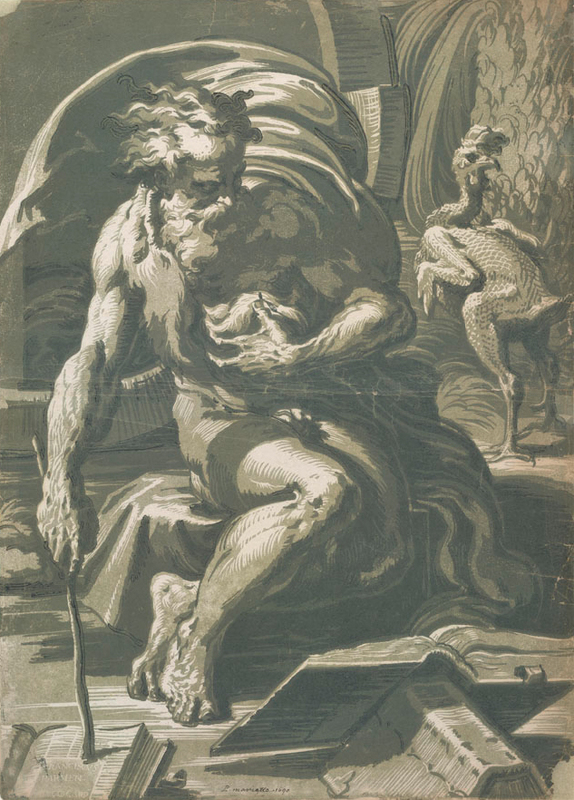 My favourite pieces were the three versions of Ugo da Carpi’s Diogenes with the old cynic, a particular hero of mine, clasping a pile of feathers and contemplating the meaning of life. The subtle use of colours together with the swirling lines of his clothing made for a stunning picture. It was noticeable as the techniques developed how colouration and the use of shade for effect took over from the earlier studied draughtsmanship. Having endured the bear garden of the British Museum’s Viking exhibition it was a sheer delight to have room and time to contemplate the beauty of what you were seeing. A much more pleasurable experience to be sure and, I have to say, more rewarding. I have been critical of some of the RA’s recent exhibitions but they have come up trumps here. If you have a chance, see it. One of the modern-day first world scandals that governments and regulators seem reluctant to address is the outrageous costs that can be racked up when using your smart phones in other countries. Having just returned from my travels I studiously ensured that all data connections were firmly switched off on my smart phone. The charges that can be clocked up are even more baffling when you can connect to the internet with your tablet or PC at little or no cost. That said, the phenomenal costs associated with data downloading has introduced a new strain of what may be termed as Darwinian evolutionary selection into play. With the advances in medical science we have seen over the last century or so, survival of the fittest (at least from a physical perspective) is a concept that is fast fading from our lives. The new test is mental acuity and the sob stories of those daft enough to clock up enormous data roaming charges from using their smartphones suggest that their genes are something the collective pool could do without. Take the bizarre case of Katie Bryan, a maths teacher from Warwickshire. She was visiting her boyfriend’s family in South Africa and had endured a lunch-time family get-together fuelled by a couple of glasses of South Africa’s finest. An album by the Traveling Wilburys (Bob Dylan, George Harrison, Jeff Lynne, Roy Orbison and Tom Petty) was playing in the background. For some reason our Katie had a fit in her head to listen to Neil Diamond’s greatest hit (plus 19 other filler tracks) and promptly set about downloading it from I Tunes for what she thought was the cost of the album – £8.99. The download took 20 minutes – by which time surely the Wilburys had finished – exceeded her 10mb monthly foreign allowance by some way – it used 326MB of data – and landed her with a bill of £2,609.31. Orange, her mobile phone company, have magnanimously knocked £2,209.31 off her bill. There are so many things to say about this. Whilst I admit that the Wilburys are not to everyone’s taste and few can claim that they represent the finest work of the artists concerned, to prefer Neil Diamond to them, I ask you! Most of us have been to parties where the music has not been to our taste but how many have been driven to such distraction that we have impulsively gone off to buy an album to drown out the background noise? And didn’t she, as a vaguely sentient human being, think that there may be some costs associated with her impulsive actions? What music would you seek comfort from in times of deep mental stress? Seems to me she needs a GCSE course in Economics and a lesson in modern etiquette. Amusingly, Bryan admits to not being a Diamond fan, preferring James Blunt (beyond the pale in my books) and already had the Essential Diamond (but not essential enough to take with you on your hols) at home. Truly a story of our times. You have been warned! In the halcyon days of my youth hitching a lift from A to B (often via C, D and E) was the mode of travel that was de rigueur for an impecunious student. Armed with a sign saying where you were intending to travel you would stand by the verge with thumb outstretched trying to catch the eye of a passing motorist. When there was a group of you the trick was for just one of you to stand by the roadside whilst your companions hid in the hedgerow, generally necking a few cans of Special Brew. When an unsuspecting motorist took pity on you, imagine their surprise when they suddenly found themselves with a car full of degenerate layabouts. Sadly, this rite of passage for the modern yoof is virtually non-existent these days. Why is that, I wonder? Partly because the cost of travel is proportionately less than it was in days of yore, partly because of safety fears – just as the motorist didn’t know what they were picking up so the hitch hiker couldn’t be sure what sort of demented psycho wanted the pleasure of their company for a couple of hours – and partly because of the improvement in in-car entertainment. Gone are the 8-track cartridges and the radios which made a cats whisker seem state of the art. Today we wiz around the countryside with all the convenience of an all-round stereo system which plugged into our MP3 player gives us unlimited access to music of our choice. Gone is the need to seek solace in conversation with some random stranger you have picked up. My thoughts turned to the lost art of hitch hiking the other day when I read a story about BlaBlaCar, a French innovation I regret to say. Founded in 2004 by Frederic Mazella after he had difficulty in getting to his family home in Fontenay-le-Comte by train, he eventually got a lift from his sister. But during his journey he noticed that the majority of the cars only had the driver in them. Spotting a gap in the market he created BlaBlaCar (no, I don’t know either) which enables passengers to buy seats in the cars of their drivers. The site calculates a suggested price for the ride and drivers can accept fares with a slight mark up. So successful has this innovation been that the site has over 6 million members in a dozen countries with a million users a month keying in their destination and getting a list of drivers heading in the same direction with their journey history and price. Et voila!. So successful has been the uptake that the French railway SNCF has cited the company as one of its major competitors. There is a Ladies Only section where women can contract solely with female drivers. Whilst this means of hitching a ride seems to me to lose the romanticism of hitch hiking and requires a degree of forward planning both on the part of the rider and the driver that I certainly in my youth was incapable of mustering, nonetheless it opens up an interesting alternative to the more customary modes of travel. It is not just our yoof who are prone to go on benders as this story from Singita Kruger National park in South Africa reveals. 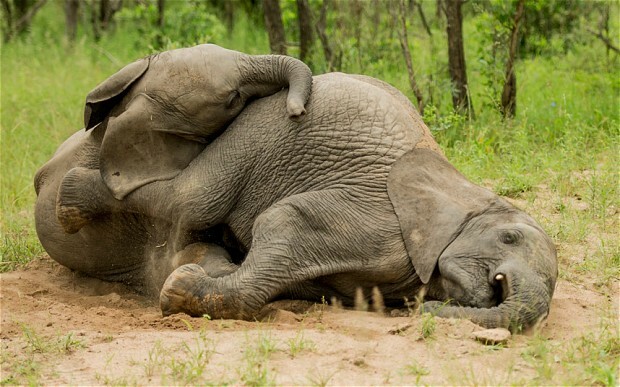 The gang of adolescent elephants became tipsy after eating quantities of the ripened fruit of the marula tree. The fruits which ripen between December and March have a light yellow skin with white flesh and are rich in Vitamin C. Apparently, they have eight times the amount of the vitamin than does an orange. They are succulent, tart with a strong and distinctive flavour and are a constituent of the liqueur Amarula. The added attraction to the fruit is that eaten in copious quantities they can have an intoxicating effect on large animals. Good to see them letting their hair down! It seems that it is not just our pole sliders who are dozy. The red face syndrome has struck the French fire service too as this story reveals. A 17-year-old garcon with a penchant for red emergency vehicles has finally been apprehended after a crime spree in which he walked into fire stations without alerting suspicion – the fire crews were presumably cleaning windows in the vicinity – and made off with one of their fire engines. Apparently, part of his master plan was to wear a fireman’s uniform which he had bought off the internet. The youth’s crime spree began last August when he stole a vehicle, drove off hitting two stationary fire engines in the process. In November he stole another fire engine and then an ambulance, also red in colour, which the police managed to stop before it got on to the nearby autoroute but at the cost of a badly dented police car. Last week he stole an emergency van and drove on to an autoroute with the local gendarmerie in pursuit. Despite being caught, he gave the rozzers the slip and stole another emergency vehicle which he drove at speeds up to 100 mph, smashing motorway toll booths (what fun!) and finally coming to a halt when he crashed into a police vehicle at Caussade. The youth, unnamed but, needless to say, sans driving licence, has been detained. Red faces all round, methinks. This was one of my favourites as a child. It went, “Georgie Porgie pudding and pie,/ Kissed the girls and made them cry/ When the boys came out to play,/ Georgie Porgie ran away”. Not exactly the perfect role model for a child but a catchy ditty, nonetheless. But who was Georgie Porgie? There are two prime suspects, both of whom were larger than life personalities in days of yore. The first is George Villiers who was the Duke of Buckingham and who lived in the early part of the seventeenth century. Villiers’ claim to fame was that he was bisexual and also the lover of the then king, James I. He used his privileged position to have his way with many of the ladies at court, his unwelcome attentions driving them to tears. The reference to running away when the boys came out to play refers to his habit of claiming royal immunity when the going got tough. Villiers achieved literary infamy as a result of his affair with Anne of Austria who was the then Queen of France by appearing in Alexander Dumas’ novel, The Three Musketeers. The English parliament got fed up with Villiers’ behaviour and put pressure on the monarch to stop shielding him, which he did. The other candidate is George IV who reigned between 1820 and 1830. 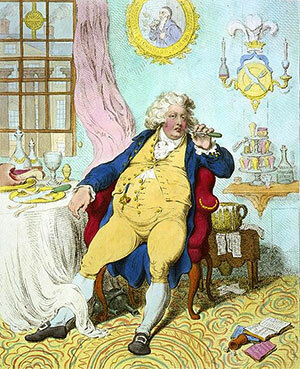 George, who earned notoriety as the fast-living Prince Regent, was not just fat but grossly obese. By 1797 he weighed in at 245 pounds and by 1824 the waist of his corset was a phenomenal 50 inches. High living – he was famous for hosting sumptuous banquets and for drinking to excess – took its toll although as a dedicated follower of fashion cut quite a dash. In his later years George took to his bed and his porcine appearance made him a target of ridicule – hence the pudding and pie in the nursery rhyme. Despite all this or, perhaps it was just a consequence of his exalted position in English society, George was one for the ladies and he had a string of mistresses and sired a number of children. It is also thought he was a bigamist. His modus operandi was to invite his prey to dinner (natch) and then attempted to take liberties with them. You would have thought that they could easily have evaded his advances by moving but what do I know. George was also a notorious coward. One of his senior aides wrote this less than flattering character assessment of the king in his diary, “A more contemptible, cowardly, selfish, unfeeling dog does not exist.. There have been good and wise kings but not many of them ..and this I believe to be one of the worst”. The Times newspaper thundered its disapproval of George, saying he preferred a girl and a bottle to politics and a sermon. It is not clear whether the Georgy in the nursery rhyme is he bisexual Villiers or the early 19th century monarch. Whoever it is, it is clear that this popular nursery rhyme is not as innocent a ditty as it first appears to be. This phrase is normally used as a retort to someone who has not taken a matter as seriously as the speaker would have liked. Not everyone, it seems, can see the funny side of a situation and can take umbrage if everyone else around them has collapsed in fits of laughter. The origin of this phrase is interesting and dates back to the Tudor times. Following Henry VIII’s fall out with the Catholic church and his embracing of Protestantism if only to resolve his immediate matrimonial difficulties and to replenish the State’s coffers, England entered into a period of religious turmoil. For religious zealots, whether of the Catholic or Protestant persuasion, it was a dangerous period to stick your head above the parapet. Losing your head for upsetting the authorities was a preferable fate to some that were meted to so-called heretics by whatever side of the religious divide were in the ascendancy. Simony, the sale of absolution or of a ticket to speed up the time you had to wait in purgatory or indeed of religious office, was rife in the Catholic church and was something the zealous Protestants were anxious to extirpate. 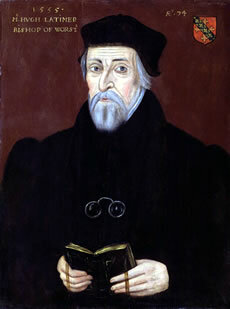 None more so than Hugh Latimer who was the Bishop of Worcester. He published a fierce tirade against the practice of selling religious favours. Contemporary reports portray him as a man of rather dour disposition and was what we today would term as a religious fanatic. In 1549, during the reign of Edward VI who favoured the Protestant cause, Latimer published a tirade against the practice of selling religious favours, entitled “The seconde sermon preached before the kynges maiestie”. In his fulminations against the practice of simony he said, “These sellers of offices shew that they beleue that there is neyther hell nor heauen. It is taken for a laughynge matter”. He continued his campaign and John Foxe in 1563 reported on Latimer’s campaign in his “Actes and monuments touching matters of the Church”. Foxe shows that Latimer was not preaching to the converted – perhaps he deliberately sought out hostile audiences – and when his audience burst into laughter either at his antics or the strength of the passion that his arguments brought out of him “the audience laughed againe, and maister Latimer spake vnto them saying: why my maisters, this is no laughyng matter. I aunsweare vpon life and death”. Unfortunately for Hugh, Edward was a sickly king and didn’t last long. His successor, his sister Mary and Catharine of Aragon’s daughter, was a fervent Catholic and soon the leading Protestants were rounded up. Latimer was burnt on the stake on 16th October 1555. I imagine he didn’t find that a laughing matter either.